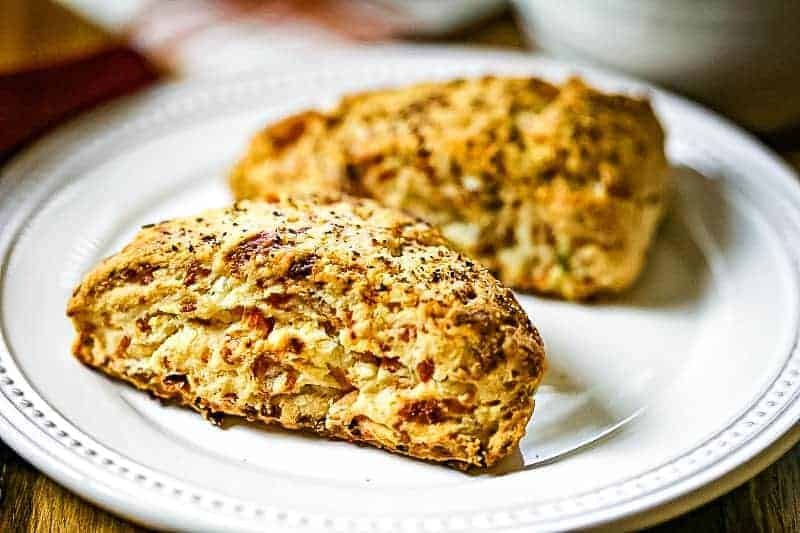 Bacon Cheddar Scones, filled with cheese, crispy bacon, and green onions are a wonderful addition to brunch menus and even pair perfectly with a savory soup. Every time I bake these Bacon Cheddar Scones, I’m reminded of all the fun we’ve had over the years on our annual day trip biking adventure to the Virginia Creeper. These savory cheese scones have nothing to do with bike riding, of course, but we enjoyed them first in a little mountain bakery on one of our trips. Isn’t it strange how powerful food memories can be? Scones are one of my favorite quick bread recipes to make. The first time I baked scones, I made a huge mess in my kitchen, but after a bit of practice I learned a few tips and now baking scones has become easy for me and my kitchen doesn’t look like I’ve emptied a bag of flour all over the floor when I’m finished! One thing I’ve learned is that getting my ingredients ready before starting to mix everything up is always helpful. French chefs religiously practice mise-en-place—the practice of measuring, peeling, dicing, slicing, or grating ingredients—before they start the cooking process. I’m no French chef, but I’ve come to adopt this practice as well and feel much less stressed in my kitchen! The basic three ingredients for scones are flour, butter, and heavy cream. Typically, scone recipes tell you to “cut” cold butter into the flour with a pastry blender until you have a crumbly mixture. I’ve found that the easier way is to FREEZE the butter first and then use a box grater to grate it right into the flour bowl. Once that’s done, add the cheese and give it a quick stir with a fork to mix it into the flour. (There’s less butter in this recipe because the cheddar cheese also acts as a binder for the bread mixture.) This process is much quicker and easier and, for me at least, less flour ends up on the kitchen counter and the flour! 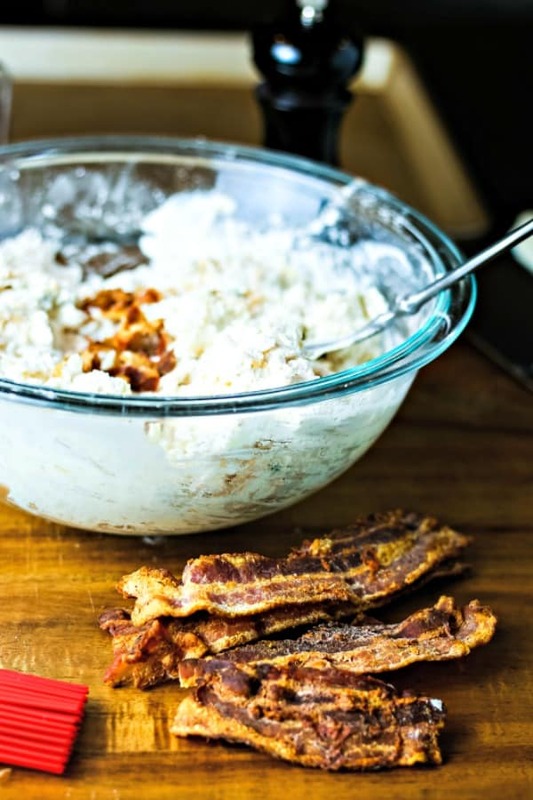 Add the chopped green onions and the chopped crisp-fried bacon to the flour mixture and give it another quick stir. Pour the heavy cream into the bowl and stir until the mixture begins to look “shaggy” or just starts to hang together. Check this by pressing some of the dough with your hands. If it’s too crumbly add a bit more cream. 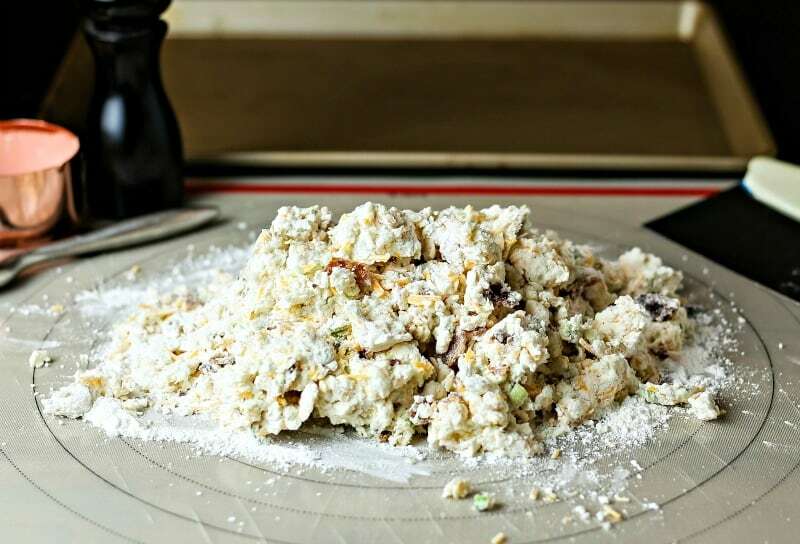 Dump the scone mixture onto a lightly floured surface. Now, for my second tip…use a pastry mat! I love this silicon mat for easy clean-up! Let’s get back to the shaggy dough. The dough will be wet and won’t hold together well until you give it a little help (after dumping onto the floured surface). Don’t knead the dough, but press together firmly to get it to hold together. Use a sharp knife or press down firmly with a bench knife to cut the log into triangles. Place the scones onto a lightly greased baking sheet and brush the tops with a little cream and sprinkle with coarse-ground black pepper before baking. 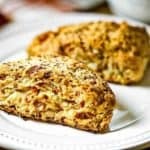 Savory Ricotta Scones – A light and fluffy savory scone that is perfect for breakfast, brunch, or served in place of dinner rolls. Buttery Sweet Potato Biscuits – Make the ultimate Southern biscuit sandwich with Buttery Sweet Potato Biscuits, sliced ham, and a smear of homemade honey dijon vinaigrette. Southern Love Biscuits – Brushing these biscuits with melted butter and sprinkling with a little black pepper gives these light and airy biscuits a crispy, buttery crust. Bacon-Scallion Biscuits with Sorghum Butter – Loaded with BACON, these savory biscuits are topped with a mixture of butter and sorghum syrup, a traditional Southern sweetener. Ham and Swiss Biscuits – Think ham and cheese roll-up, only much, much better! I love the Virginia Creeper because it makes me feel very accomplished to finish a 17-mile mountain bike ride…even if it is all downhill! 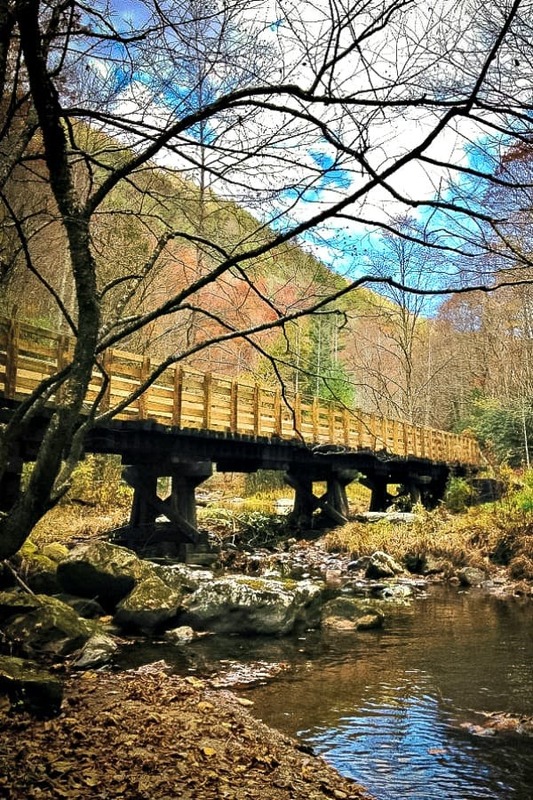 The trail is a beautiful gentle descent down a retired railroad bed with over 40 trestles and bridges. 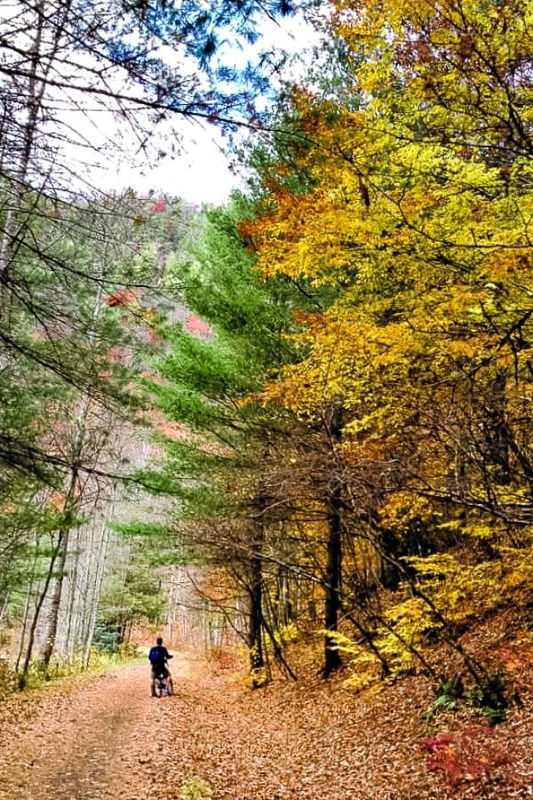 During the Fall, the trail is absolutely stunning! 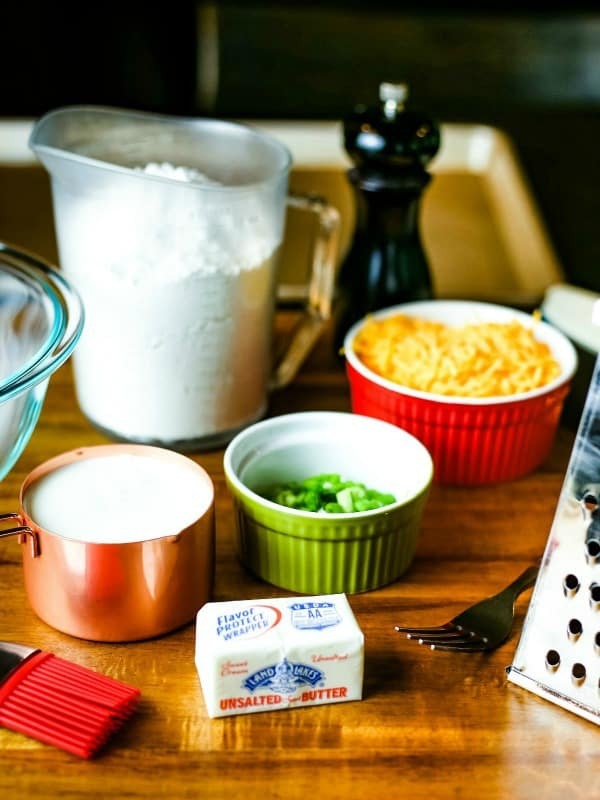 DID YOU MAKE THIS BACON CHEDDAR SCONE RECIPE? Preheat oven to 425 degrees. Lightly coat a baking sheet with cooking spray; set aside. Place flour into a large bowl. 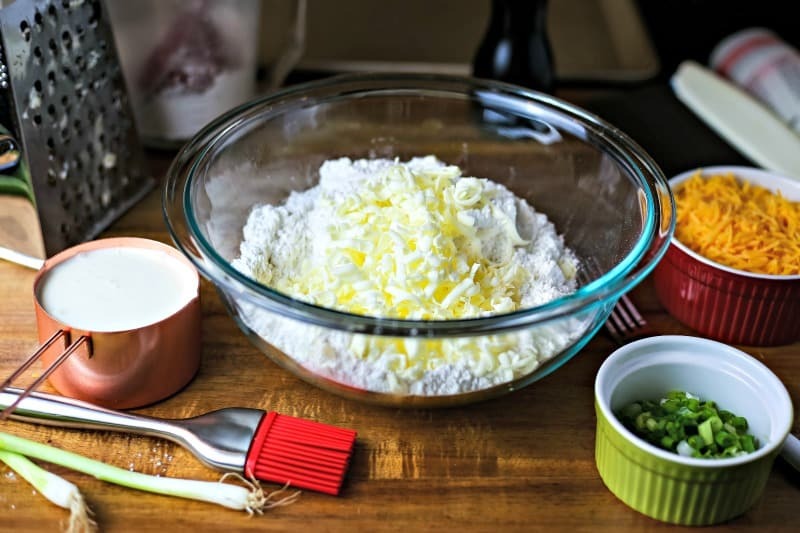 Using a box grater, grate butter into the bowl with the flour. Add shredded cheese and stir together with a fork. Stir in the green onions and bacon until evenly distributed. Add 1 cup of the cream, stirring to combine. If needed, add more cream until the dough comes starts to come together. The dough should be "shaggy" with some lumps and loose amounts of flour. 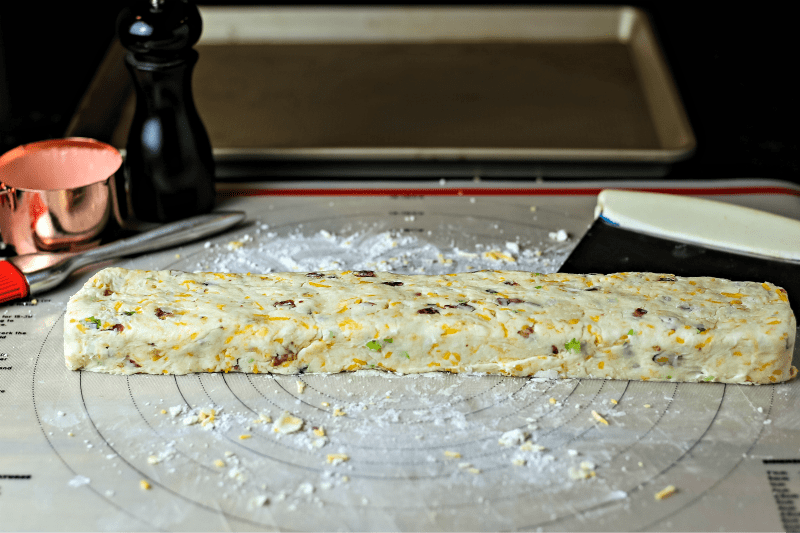 Dump the dough onto a well floured surface and begin to squeeze and pat it together with your hands to form a log about 12-14 inches long and 4 inches wide. Use a knife or bench knife to cut the log into wedges. Transfer to the prepared baking sheet about 2 inches apart. Brush the scones with a bit of cream or milk and sprinkle with freshly ground pepper. « One Easy Recipe, Two Tasty Pumpkin Snacks! yum!!! I’m making these for dinner tonight. Thanks!